Mathews went back to the drawing board for the 2015 lineup and delivered the No Cam bow series. The bow we are going to look at in this review is the Mathews No Cam HTR, or their hunter version. Let’s take a look at this bow’s specs. The Mathews No Cam HTR has one thing in common with all of Mathews Inc’s other bows; its of very high quality. The HTR has a beautifully designed, less reflexed riser that comes in at just under 29 inches. The No Cam HTR sports rigid quad limbs that are shorter than some limbs but still very powerful. The Mathews No Cam HTR also comes equipped with the Focus Grip which, in our eyes, is one of the best grips on the market. While we were shooting this bow for the first time, we noticed the level nock travel and smooth draw cycle. This bow is a pleasure to draw back and hold. The second thing that we really notice was how quiet the Mathews No Cam HTR was during the shot. The bow’s design maintains speeds comparable with other flagship bows but did so while delivering one of the quietest shots we have ever experienced. 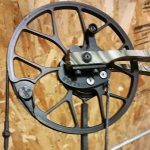 After setting up, tuning and shooting the Mathews No Cam HTR, we did experience some issues with one of our staff’s two Mathews No Cam HTRs. While paper tuning one of our 70 lb right handed No Cam HTR, we encountered a left tear that we couldn’t get rid of. We understood that we needed more cam lean to correct this issue, but due to the binary cam like system of the No Cam HTR, we couldn’t yoke tune it; we had to change out the “top hats” or cam shims. After experimenting with different sized top hats in a variety of arrangements, the problem remained. We tried every last ditch modification to improve our paper tuning results including changing the rest; nothing worked. The only way we could get a perfect hole through paper was to intentionally torque the bow toward the riser. After talking to Mathews Inc, it was determined that one of the split limbs was out of deflection tolerances. Mathews replaced the limbs at no charge and the new limbs resolved the problem. With the new limbs we were allowed to get the bow tuned to our satisfaction. 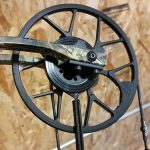 These types of situations do happen with all manufacturers and it was great to have Mathews Inc.’s support immediately act to fix this problem ASAP. Like we have known for many years, Mathews Inc. stands behind their product and will do what they can to resolve any issues with their products. This bow is a new concept and a new design. With all new first issued technologies, there are normally some bugs to work out and the Mathews No Cam isn’t immune to that. Even with the issues we encountered, the bow still outperforms many other bows on the market. Mathews is a company that has consistently made some of the highest quality bows on the market and they have excellent customer support. You should notice subtle tweeks with the 2016 lineup that are probably the result of the maiden voyage of the No Cam HTR. We are looking forward to shooting the new 2016 Mathews lineup and expect them to be better than ever. This bow is a breath of fresh air from Mathews Inc. Being extremely shootable, fast, and quiet will make the Mathews No Cam HTR one of the most popular bows of 2015.